Fans welcome ESPN's College GameDay bus as the production crew arrives at Martin Stadium. 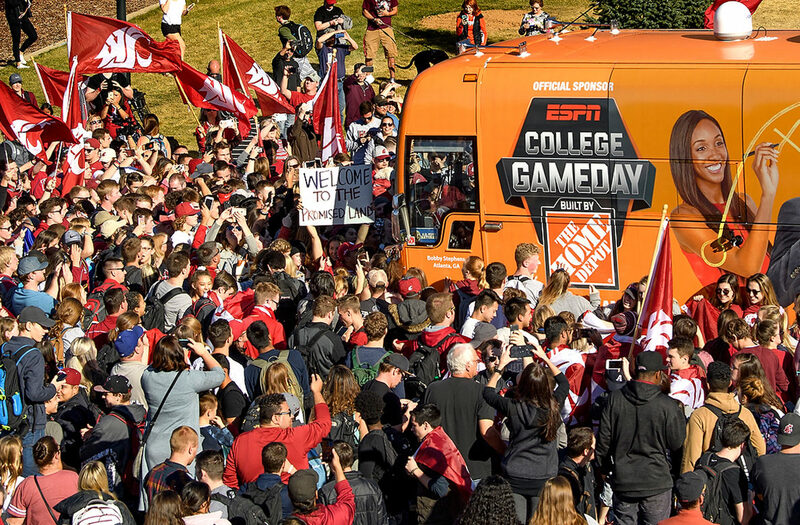 Preparations are continuing across Pullman for what’s expected to be major crowds drawn to the Palouse for Saturday’s first-ever ESPN College GameDay broadcast from WSU. The Emmy Award-winning sports show is setting up its outdoor broadcast booth across from the Cougar Pride statue near the intersection of Stadium Way and Ferdinand’s Lane. The program will air live from 6 a.m. to 9 a.m. Saturday, helping elevate WSU’s national exposure and fulfilling a 15‑year push by Cougar Nation to bring the popular show to Pullman. Tickets are sold out for the Saturday afternoon football matchup between 25th‑ranked Washington State and No. 12 Oregon but Beasley Coliseum and other big screen-equipped venues across campus will be open to help accommodate the crowds. Kick‑off is set for 4:30 p.m.
A dedicated page packed with useful information can be found at the WSU Athletics website. The ESPN College GameDay broadcast is expected to include plenty of crowd shots from around the booth, as well as taped segments of the campus. Additionally, beginning at 4 a.m. Saturday, the network will begin letting up to 500 fans into a special area known as “the pit,” which gets a lot of screen time during the show. There is no cost to participate but those entering the pit will be subject to security screening, and signs must comply with rules set by ESPN and the university, such as no vulgarity or political messaging. No food or drink will be permitted inside the pit. Fans lining up early for a chance to get into the pit for the broadcast can bring portable chairs, sleeping bags and blankets for the wait, but no tents will be allowed. Ferdinand’s Lane was closed to vehicle traffic Tuesday night, and will remain that way through Saturday. A portion of Stadium Way will close from 1 p.m. to 4 p.m. Thursday to accommodate preparations for the ESPN broadcast. Stadium Way from Wilson Road to North Fairway will be closed most of Friday, beginning at 9:30 a.m.
On Saturday, the Stadium Way closure will be expanded to the stretch between Grimes Way and Cougar Way until after the football game. In addition to the customary shuttle service provided by Pullman Transit during home football games, the city will operate an early morning route for those heading to campus for the ESPN broadcast. The early shuttles will begin service at 5 a.m. from Park and Ride 3 lot at Terre View and Highway 270 with drop off at the Bustad bus stop. The CUB will remain open 24 hours beginning Friday, with some food court vendors opening as early as 5 a.m. Saturday. A kick-off event and big screen viewing of the game live will be available in the CUB’s M.G. Carey Senior Ballroom. Einstein Bagels and The Market, located in Global Scholars Hall along Cougar Way, will remain open continuously from 7 a.m. Friday to 1 a.m. Sunday. The Hollingbery Fieldhouse Food Fair opens at 1:30 p.m. Saturday. Freshens in the Chinook Student Center will be open from 9 a.m. to 4:30 p.m. Saturday. Beasley Coliseum and The Spark will open at 3:30 p.m. for those without tickets who want to watch the game on campus from a big screen.